Leverage industry-leading innovations and spend more time growing your business. To ensure your business remains competitive, it must stay ahead of the curve. Accounts payable may not seem like a profit center, but when you automate the invoice process, you get control over what’s going out the door. You can see spending before it’s spent, catch duplicate invoices, and save time with mobile approvals, invoice tracking and faster payments. It’s how you make AP systems more like AR systems. 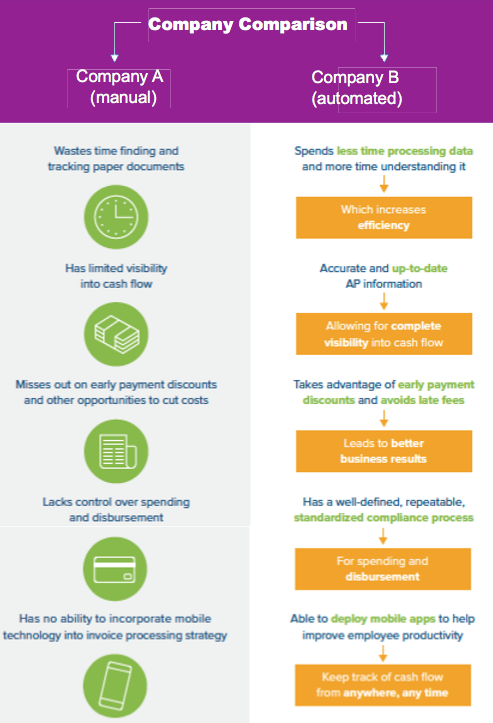 Automating AP simplifies the process and eliminates costly errors. Concur Invoice for small businesses gives you full visibility into spending – so you can proactively control it. You can catch duplicate invoices, speed up vendor payments, easily manage exceptions, and track and approve invoices on your smartphone. Concur Invoice Management is an ideal automated solution. Searching for an invoice management solution that can simplify the approval process and move invoices along with clear rules, permissions, and escalations? Look no further. Transparent. Complete visibility lets you see what you need to see so you can make the decisions before money is spent. Effortless. Manages your company’s spending on a universal, easy to learn system. Concur – Sage 300 Integration. At Equation Technologies, we know your business needs sometimes extend outside of Sage 300. We specialize in streamlining business processes by eliminating duplicate data entry or work arounds and integrating between Sage 300 and other corporate applications. We are a certified Sage Development Partner and have staff devoted exclusively to system integrations. With our Concur – Sage 300 Integration, we can integrate AP invoices, expense reimbursements, vendors, and AP payments. If you are currently using Concur and wish to automate with Sage 300, we can help. Or, if you are interested in learning more about Concur and how it can help your business, contact us.